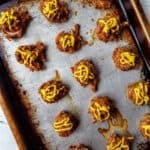 Step up your #tailgate eats with this simple, six ingredient Pretzel Turkey Meatballs! In a large bowl, combine turkey, pretzels, garlic powder, smoked paprika, and both mustards. Stir continuously with a spatula until all ingredients are nicely blended together, about 4-6 minutes. Form meatballs into 1" balls using your hands. Place on a baking sheet lined with parchment paper or sprayed with cooking spray. Bake for 20-22 minutes, or until internal temperature reaches 165*F.
While baking, mix additional 2 tablespoons mustard with sriracha sauce. Remove from oven and top with sauce. Store turkey meatballs in an airtight container in the fridge for up to 5 days. Do not recommend freezing. Reheat using a nonstick pan over medium heat for best consistency.